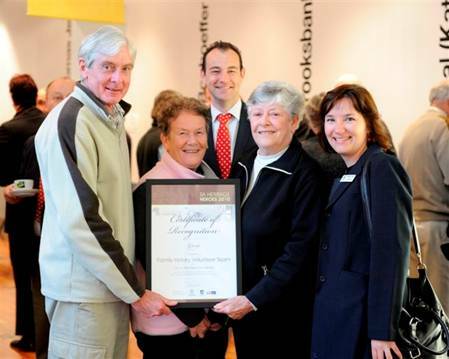 Did you know the City of Tea Tree Gully Library’s Local History Volunteers were recently recognised as finalists for the Heritage Heroes Award? The Heritage Heroes Award is an annual award which celebrates South Australia’s heritage. It is open to volunteers working in a heritage field or organisation. The “One on One Family History Help,” project was nominated, which developed in 2009 in response to a growing interest in family history. It has gone from strength to strength over the past year with its popularity far exceeding initial expectations. Collectively the Local History Volunteers have donated 2,594 hours of their time and assisted more than 850 people during 2009 to 2010. In addition, Melaina Tate, Librarian for Library Partnerships, here at the City of Tea Tree Gully Library recently gave a short presentation at last weeks Council meeting on the 14th September to celebrate the Heritage Heroes Award and acknowledge the time and dedication our Local History Volunteers share with the community. The City of Tea Tree Gully Library simply could not achieve all the things we do without the support, hard work and ideas of our volunteers. If you are interested in making a booking with our fabulous Local History Volunteers for One on One Family History Help please contact the City of Tea Tree Gully Library on (08) 8397 7444. This entry was posted in events, family history, local history and tagged family history, Heritage Heroes Award, local history, volunteers by ttglibraryjess. Bookmark the permalink.